If ever there has been a character with something of an identity crisis over the years, it has probably been Green Lantern. Consider for a moment the twists and turns the persona has taken and those who have claimed the title and uniform of Earth's (and the rest of the sector's) galactic guardian: Alan Scott (though he tended to stick close to home), Abin Sur, Hal Jordan, Guy Gardner, John Stewart and these days Kyle Rayner. In fact, for a long time, DC seemed to be directionless with regard to poor Hal Jordan's fate as a character. You'll doubtless note my disapproval as I spend a few moments on the topic. 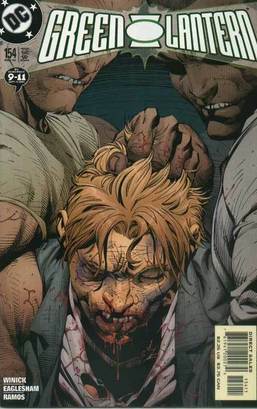 The series was canceled or languished at more than one point and they tried pairing him with Green Arrow in a double bill for a while to try and save the flailing title. While I've read precious little of the GL series in the post Silver Age, I'm aware of some of the evolutions (or devolutions) that have taken place. For a time, one of my favorite characters and the second great resurrected Silver Age hero became an evil being known as Parallax. As I understand it, Parallax destroyed the Green Lantern Corps and all but one of the Guardians! Then they decided to make him the new Spectre, for pity's sake. What was that all about? There was experimentation with the GL/GA period, too, as they tried writing socially relevant material. I tackled one of those issues here awhile back. About the only thing they haven't done with Green Lantern is to give him a super-powered sidekick, which I think is good. "Kid Green Lantern" just wouldn't cut it for me, though some of Guy Gardner's antics beg a comparison as far as maturity levels. So recently I'm reading the New York Times and to my surprise and shock I learn that they've decided to use the title for something controversial yet again: Introduction of an openly gay character (in a two part story told in issues #154 and #155). You've got to be kidding me. My pal the Webmaster and I discussed this for a bit and we have similar attitudes. One's sexual orientation is a personal, private matter. Live and let live. My opinion, however, is that this topic has no place in a super hero comic book. To echo my sentiments when I reviewed Green Lantern #76, this sort of thing should be in a social studies curriculum. I further find it of interest that the old Comics Code Authority (which is doubtless spinning in it's grave) was possibly at it's most stringent during the Silver Age, yet that era has stood the test of time as a period of unprecedented creativity. This new trend smacks of sensationalism and as our host here at the Silver Lantern speculated, perhaps it's simply a way to gloss over sub-par art and story telling. C'mon, guys. Surely you can do better than this. Your heritage demands at least that. I've said my piece. Back to the safety and enjoyment of my beloved Silver Age and a new review of a Green Lantern title worthy of the name. It's the fourth installment of the Zatanna series and this time it was six months between issues when we find ourselves in Green Lantern #42 from January of 1966. As usual it's Gardner Fox at the storytelling helm with the able assistance of Gil Kane and Sid Greene doing the artwork. Editorial supervision provided by Julius Schwartz. Join me now, faithful reader as we explore "The Other Side of the World!" Have you ever noticed how often our Silver Age heroes seem to be pitted against a scarlet skinned bad guy with demonic features? If it's not Sinestro it's The Spectre battling Azmodus or Shathan the Eternal, both of which I've reviewed here at the Sage. Maybe Gardner Fox's hand in the stories has a bearing on it, eh? Well, prepare to greet another member of the club as Green Lantern with the assistance of Zatanna engage The Warlock. Our opening scene is a rather fantastic site. A ruin in the coastal regions of Brittany thought to be part of the legendary drowned land of Ys. We soon witness a Roman Centurion seeking shelter there only to be enveloped in a burst of blue flames, disappearing under their influence. Through the centuries multiple people who stumble upon the ruin also succumb and vanish from this world in blue fire. Then comes Zatanna, intent on conjuring up the flames of Ys with her trademark backward incantation: "EMALF FO SY—EKAT EM OOT!" (Flame of Ys—Take me, too!) Soon the blue blaze appears to envelop the magical maiden, but her thoughts reveal that her spell has gone terribly wrong. Fade now to a familiar setting; the Ferris Aircraft Company where our favorite crack test pilot, Hal (Green Lantern) Jordan along with Thomas (Pieface) Kalmaku are preparing to leave for a fishing trip when Carol (The Boss) Ferris bursts in to report that she's just learned of a pirate robbing in Coast City. She asks Hal to accompany her to town to investigate. Our hero pauses and ponders his dilemma. He is pleased that Carol is turning to him for a change rather than his alter ego, but he also feels the pull of duty as Green Lantern to investigate this odd interloper. In the next moment, Pieface intervenes, offering to join Carol as Hal is exhausted from his last test ride. Carol agrees and goes to fetch the car. 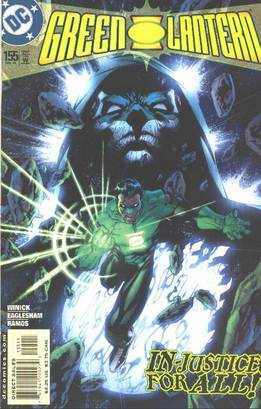 Hal seizes the opportunity to don the familiar emerald and black uniform of the Green Lantern Corps and proceeds to his ring charging ritual at the battery of power. Strangely, though, the oath comes out backward, just like Zatanna's incantations. Pieface is confused, but no more so than Hal. Our hero doesn't hesitate, however, and takes to the skies. Meanwhile, in Coast City, Patch-Eye Pete, an extra large pirate, complete with a golden cutlass, is busily breaking down the doors of the Shoal Waters Bank vault. On-duty bank guards fire into the figure to no effect and Pete continues his task with gusto, uttering piratey phrases along the way: "With a fair wind blowing and a million dollars in my ditty bag I'll be the happiest Sea Dog alive!" In the next fateful moment, Green Lantern arrives. Nonplussed, the pirate fires his pistol at the airborne figure. GL recoils for a moment, puzzled at the pebbles that emanate from the barrel. In the next moment, the pebbles grow into massive boulders, which the Green Gladiator swiftly manages to utilize by reforming them with his power ring into a scoop shovel. Pete puts his golden cutlass to use again, slicing the shovel to pieces. He then follows up with a blast of his other pistol, causing the stony debris to form a flying fist at Hal. GL decides to try something more appropriate in the engagement and forms an old-fashioned cannon to fire at the pirate. The cutlass is brought into play yet again, neatly slicing the cannonball in two, while Green Lantern forms a ship's wheel to hurl at the criminal. This time Pete hurls his yellow blade directly at Jordan. Knowing full well that his ring is powerless against the yellow weapon, he nonetheless gives in to an urge to form a shield against it. To his surprise and relief, the blade shatters against the shield and Patch-Eye Pete begins to swiftly depart, literally flying over the waves of the Atlantic. Pausing for a moment, he turns and again fires his enchanted pistol, which then produces metallic flowers that grow into propeller blades. This is the latest obstacle Green Lantern must face as Part I does a fade-out. Part II gives us a chance to see how Hal deals with the danger and once again his resourcefulness serves him well as he uses his power ring to temporarily raise a shipwreck as a shield. The pursuit then continues until the pirate leads GL to the ancient ruin of Ys. "You're too slack in your stays, my bucko! Here's where I square yards with you! Our battle is all dickey now!" He then disappears into the blue flame as the very air around him explodes, leaving our hero in a concussive wave. In the next moment, Green Lantern hears a voice. "Up until this moment—I have failed you completely! But never fear—I shall save you!" Zatanna then appears. "Here, give me your hand—that my magic may grip you more securely! I have only a few minutes to alert you to the dangers we face—before we are drawn into the other side of the world!" Quite the dramatic entrance, eh? Zatanna quickly explains to the Emerald Gladiator who she is and what she seeks as well as relating her previous attempts to find Zatara with the help of Hawkman, Hawkgirl and the Atom. She pays particular attention to the declaration of the Druid during her story and tells of her studying of ancient manuscripts which finally led her to Ys, where she encountered the ruin with it's mysterious blue flame. The ruin, she explains, is a portal to the "other side of the world", which is a place not of this Earth, ruled by the Warlock. In this realm, people do not age and it is enchanted in such a way that magical forces instantly replace any natural resource that is consumed. 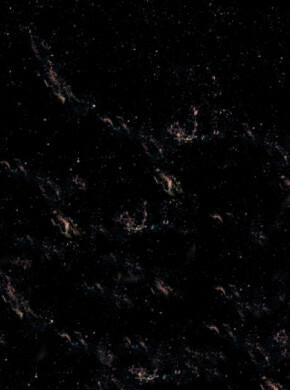 Unlike the "big bang" that formed our world, this place came into being by a steady state flow of primal matter in the form of a cosmic cloud. "There is not time in that world, only a constant "now"—an eternal present." The weird figure of the Warlock was the sole inhabitant and he was restless, despite his formidable magical abilities. He discovered the Earth through a mirror and decided to try and experience it. The Warlock somehow realized that he could not enter this newly discovered world, so he conjured up the pirate as a way to lure Green Lantern to his realm so that he could use the power ring to cross over into Earth. Zatanna, meanwhile, stuck between the worlds, battled the evil mage and also tried to aid Green Lantern by sending some of her magic to him, thus causing the odd backward oath that our hero uttered before. Now that Green Lantern is fully up to speed on the who, where and why, he suggests they find and defeat the Warlock. No sooner do they arrive in the other world than his famed ring leaves his finger. Zatanna quickly tries to conjure it back and discovers that if she speaks her sentence, but not her words backward, she is effective in this place. In the next fantastic moment, an army of warriors from across the ages assembles to take the power ring by force. Unfortunately, GL is having some technical difficulties and cannot get the ring to function in this odd land, so Zatanna works her spells to keep the warriors at bay. Her efforts are effective until the Warlock pulls his trump card by dispatching a second, more formidable army, composed of mystical creatures such as demons, imps and djinns. Just before the duo are overrun, the Emerald Warrior hits upon the key to unlock his ring's power, by switching it to his left hand. Now the battle is on again in earnest and Green Lantern uses many clever methods to ward the villains off, finally causing them to sink into the ground, which he then immediately solidifies to imprison them. Victorious, the duo fly to the tower where the Warlock lurks. When they reach him, Zatanna demands to know the whereabouts of Zatara. The Warlock refuses, but offers to make a bargain. In exchange for the ring he covets above all else, he will reveal what he knows of the famed magician. He further demands that no tricks or commands be given to the ring to capture him. Incredibly, our hero agrees! Zatanna immediately protests, but GL stands firm and hands the ring over, swearing on his honor to do nothing untoward. Gleefully, the Warlock takes the ring and reveals that he and the Druid were friendly and that the Druid banished Zatara to the Warlock's world, where his magic would be useless. The Warlock, believing Zatara to be helpless, focused his energies on creating a crystal ball from a rare element to enable him to gain passage to Earth. Zatara, however, took possession of the crystal ball and used its power to disappear in an enchanted burst. Ever since then, the Warlock has been searching for Zatara and his irreplaceable crystal ball, to no avail. Finished with his tale, the malefactor raises the ring in triumph and orders it to take him to Earth. Unfortunately for him, the ring responds in quite a different way, sending concentric circles of energy outward, paralyzing him in his tracks. Protesting that Green Lantern tricked him, Hal replies that it wasn't he, but Zatanna who tricked him, by touching the ring and ordering it to keep the Warlock forever motionless, but still alive. Thus the evil one suffers a fate very similar to that of his partner, the Druid, never to cause trouble again. This tale is completed with Zatanna more determined than ever to build upon what she's learned to complete her search. Green Lantern pledges his future support and wishes her well as the curtain falls on her latest efforts. 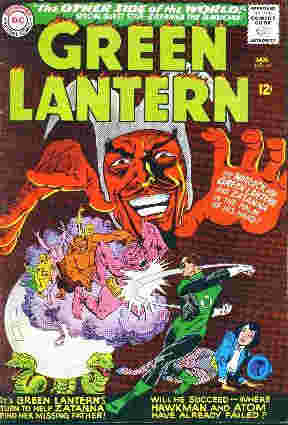 In a roundabout way, this issue revisits the combination of Green Lantern with magic. The original Green Lantern, Alan Scott, was a bit different from our Silver Age version. While I have yet to read much of the Golden Age GL's adventures, I do know that his ring seemed to be a little different. It was described as being powered, at least in part by "occult" properties. I don't think he ever hobnobbed with the Guardians of the Universe, either and if you look back at my review of Showcase #55 featuring Doctor Fate and Hourman with a guest appearance by the Golden Age Green Lantern, you may recall that the new and improved bubble they imprisoned Solomon Grundy in was a combination of Dr. Fate's wizardry and the emanations from GL's ring. It was an easy match, which further leads one to believe that the original Green Lantern was a bit more mystic as opposed to Hal Jordan's otherworldly ring. For that reason, there's certain logic in the alliance we just saw between Hal Jordan and Zatanna the magician. A fine alliance it was, too, with another imaginative setting, fraught with peril but overcome with splendid teamwork. Another worthy entry in the continuing series that I'll rate with a 9. Remember to rejoin me in approximately two weeks for the next installment of this classic quest. We'll be headed back to Batman's Detective Comics, but Gotham City isn't where we'll find Zatanna. You'll need to come back to get the skinny and meanwhile, let me hear from you. The address isprofessor_the@hotmail.com. Thanks, as always for stopping by.